No company wants to be known as the “company that never delivers.” That’s what poor inventory optimization leads to, as customers wait for that guaranteed two-day shipping that turns into three, four, five days, and beyond. To stay competitive and keep customers loyal, you need to know where to store inventory and for how long. 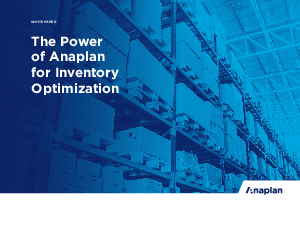 Optimizer for Anaplan makes inventory optimization fast and easy.